"Entertainment is not a one-size-fits-all world. We want you to be able to choose the hardware that makes sense for you, so we are working with multiple partners to bring a variety of Steam gaming machines to market during 2014, all of them running SteamOS." Not long after, at CES 2014, Valve revealed a full line of Steam Machines from 14 different companies. Chief among them was Alienware, Dell's gaming PC arm, which showed a teensy $550 box called the "Alpha." Alienware was a standout not just due to name recognition, but because the company proposed a launch window for its "game console". The Alpha won't ship with any of the promises of the Steam Machines initiative: no Steam OS and no Steam Controller. Valve's delayed both, but Alienware's pushing on nonetheless with a fall launch. That's all to say one thing: While the Alpha is still a "Steam Machine" in size and horsepower, it isn't a Steam Machine. 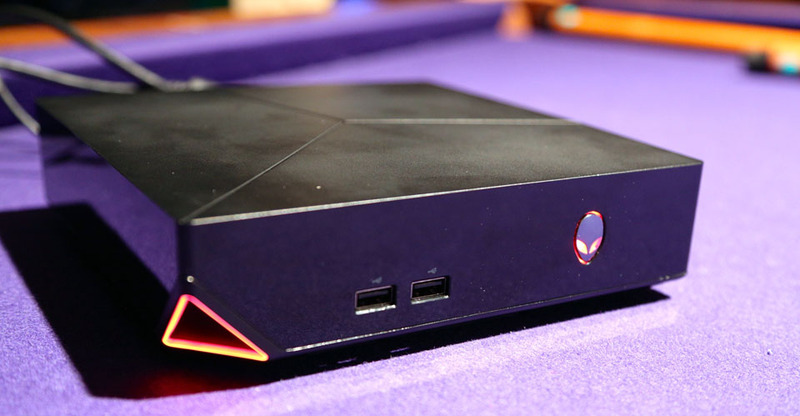 The Alienware Alpha is a weird gaming PC. Alienware held an event last week in New York City to show off the Alpha. We were given time to play games on the system, sure, but the focus of the event was on the custom operating system that Alienware's built to get around the fact that Valve's initiative isn't ready. According to Alienware, Valve president Gabe Newell sees the Alpha as the "ideal Steam Machine." It's hard to see how, at least at the moment: It runs Windows 8.1, it ships with an Xbox 360 wireless gamepad, and it requires a USB-based wireless dongle to make that gamepad function. Alpha is $550 -- $50 more than the most expensive new game console -- and it's lacking in the horsepower department. Which GPU is inside? A "custom" NVIDIA Maxwell GTX. How about processing? Handled by an Intel i3. In so many words, the Alpha is roughly as powerful as the Xbox One and PlayStation 4, only it costs more and is nowhere near as accessible. We've seen levitating pens, levitating lamps, levitating loungers and even levitating fish -- now there's a Bluetooth speaker to add to the mix. OM Audio, maker of such respectable audio accessories as the Inearpeace earphones and Mantra speakers, has taken a bold leap into the world of novelty products with the OM/One. The compact sphere can be used with or without its magnetic base (which requires an AC adapter), and includes an integrated battery with up to 15 hours of continuous play. There's also a microphone on board, so you can use the OM/One as a speakerphone as well. We had a chance to check out an early prototype, which you can see in action after the break. Sound quality was fine -- not fantastic, but on par with other compact Bluetooth speakers. You can improve the experience by adding a second OM/One, which pairs with the first to produce stereo audio. 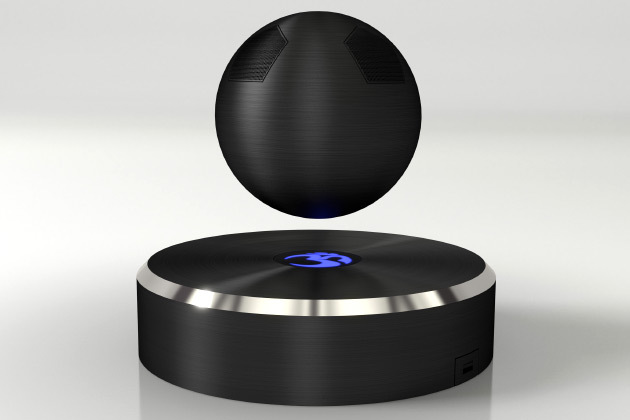 The levitating effect is interesting to look at, but it also reportedly helps produce better audio with a lower-power driver, since nearby objects won't absorb sound. You can pre-order it today in black, white or "disco ball" on OM's site for $179. OM reps expect to ship the first batch in December. Microsoft's been awfully busy at this year's SIGGRAPH conference: <embers of the company's research division have already illustrated how they can interpret speech based on the vibrations of a potato chip bag and turn shaky camera footage into an experience that feels like flying. Look at the list of projects Microsofties have been working on long enough, though, and something of a theme appears: These folks are really into capturing motion, depth and object deformation with the help of some slightly specialized hardware. Consider the work of researchers from Microsoft Research's Redmond and Cambridge outposts -- they figured out a way to turn a run-of-the-mill 2D camera like the one embedded in your phone or perched atop your monitor into an infrared camera usable for capturing depth data, sort of like a Kinect. 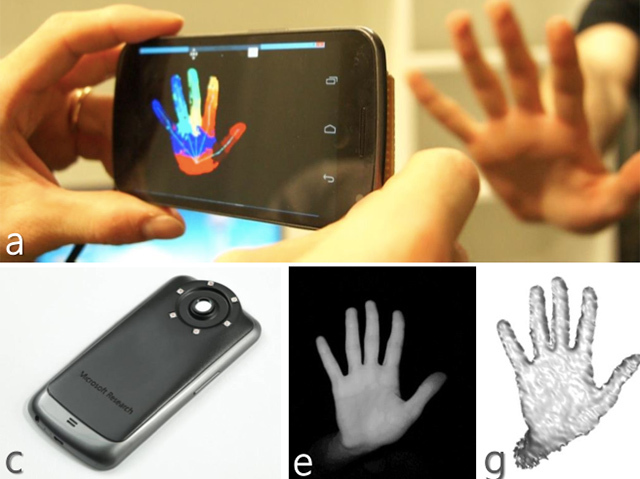 The team made working depth sensors out of a tweaked Android smartphone and a Microsoft webcam, and both were able to track a user's hands and face with aplomb, making them awfully interesting (and relatively cheap) hacks for tinkerers who want to create and test gesture-centric projects without much hassle. Yet another project saw a team of researchers develop their own RGB-depth camera out of off-the-shelf parts. Why? So they could figure out a way to meld it with software to capture 3D models of people and objects that deform, shift and shimmy in real-time. Imagine holding an inflatable ball in the palm of your hand -- it'd be a piece of cake for an RGBd camera to capture it and for modeling software to render it as a sphere. Now imagine squeezing that ball; imagine the bulges and depressions that take shape as your grip tightens. Between their camera and their software, these researchers have managed to create deformable models much faster than before; it might not be long before such objects wind up in your next frag session. A decade ago, OpenStreetMaps launched as a free, open-source alternative to the other mapping tools you may encounter on the internet. Turns out that the collaborative experiment worked exceptionally well, and thanks to a new site, you can see for yourself how the Wikipedia of mapping has covered the whole planet. 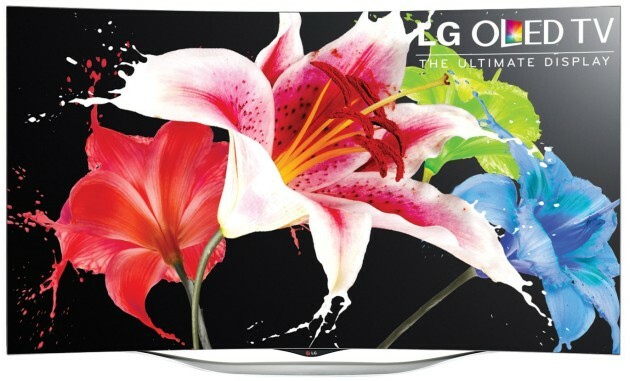 Now that plasma TVs are really on their way out, it's the perfect time for a true alternative to LCD, and LG is ready with its cheapest OLED TV yet. The 55EC9300 is the third generation of curved 1080p OLED TVs to roll out and with a price tag of $3,500, the price has dropped 75 percent since the first one debuted a year ago for $15,000. It's still pricey for its size, but you won't have to choose between tuition and a TV this time around. Inside is the webOS Smart TV platform we loved at CES, and of course, the new display technology that is supposed to bring better colors and deeper blacks than have ever been possible before. The question now, is if the improved colors of OLED are a better option than the high-res 4K screens currently flooding shelves. If the rumors are right, we'll see a 65-inch 4K version soon that cuts out the compromises, but costs twice as much. You'll be able to get your own eyes on the screens soon -- pre-orders are available through Best Buy and Amazon, and Best Buy will sell the set starting on the 24th. You won't have to wait long if you're hoping for a new round of Windows Phones with powerful cameras. 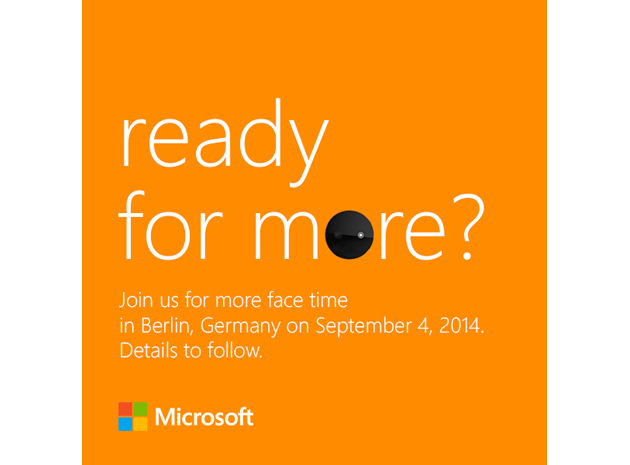 Microsoft has just sent out a save-the-date notice that asks the media if it's ready for "more face time" at a Berlin event on September 4th, just ahead of the IFA technology show. There's a Lumia 1020-style camera module not-so-subtly woven into the text, too. While there are no dead giveaways in the teaser, it's not hard to figure out the references. Our hunch is that "face time" is an allusion to "Superman" (aka the Lumia 730), the selfie-oriented Windows Phone that leaked just a few days ago. The module is slightly more cryptic, but it might be hinting at the aluminum-clad, 13-megapixel "Tesla" (Lumia 830) that reportedly surfaced last month. We're headed to IFA, so you should expect to hear much, much more about any new Lumias within a few weeks. Last summer, Lomography debuted its offering that allows photogs to build their own 35mm SLR. 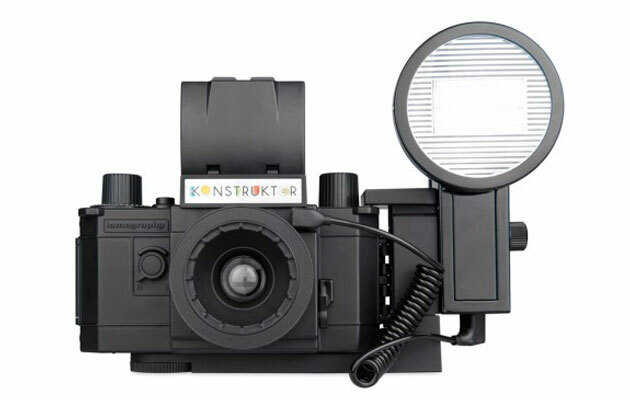 Now, the retro-minded snapshooting outfit is lending the Konstruktor more film-shooting skills with flash kits. Thanks to a $20 accessory package, the latest version of the DIY camera can be paired with a Lomography flash should the need arise -- if you've already splurged for proper lighting add-on. Those who've yet to take the leap can nab a bundle that includes the disassembled Konstruktor F, requisite accessory kit and a choice of flash for $103-$111 (depending on said selection). Not only can you put together the camera you'll use for to capture that next road trip, but you can ensure those images will be well lit, too. It can be difficult to get waterborne objects to go in the right direction -- just ask any boat captain who has had to fight waves on a choppy sea. However, researchers at the Australian National University have developed a "tractor beam" (really, a wave generator) that would make it trivial for you to float anything to its intended destination. The system creates complex 3D waves that have their own currents, letting you pull a target simply by adjusting the waves' frequencies and sizes. In fact, you can produce any flow you like; scientists in the lab made vortices on demand. A generator like this wouldn't be useful when dealing with big cargo ships in the open ocean, but the team sees it as very handy for controlling many other objects. You could bring small boats into port, for instance, or contain oil spills without using barriers, burns or chemicals. 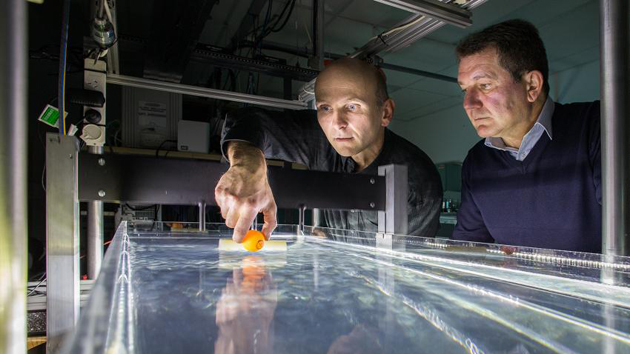 The invention could be used to simulate challenging sea conditions, too. Any practical uses won't be ready for a while, but there could be a day when you don't have to worry about crashing into the docks (or other boaters) after a sailing expedition. Blackmagic's 4K URSA camera is (yet again) late after it was announced at NAB in April, but it looks to be worth the wait. Cinematographer John Brawley -- who also demo'd early footage of Blackmagic's Pocket Cinema Camera -- has just shown the first footage from the $6,000 camera. The URSA is a large departure from past models, as it features a 10-inch, 1080P pop-out display, traditional camcorder form factor and a user-replaceable 4K sensor with a global shutter. It also bests previous Blackmagic models by shooting 4K at 60fps, the speed Brawley used on all but one shot. He used a Cooke 25-250 MK3 T3.7 (PL mount) zoom lens, shooting onto several 128GB SanDisk CFast 2.0 cards at UltraHD (3,840 x 2,160) resolution. 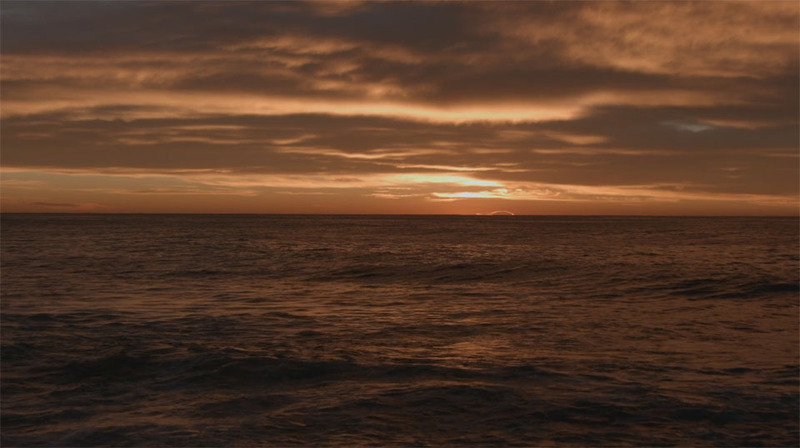 As you'd imagine, the footage looks amazing and Brawley said Vimeo doesn't do the original ProRes HQ files justice. The only problem is that the camera is double the price of Blackmagic's Production Camera 4K -- but it's still a lot less than pro models like Red's Scarlet Dragon. Until now, if you wanted a Chromebook with a full HD display, you only had one option: the 13-inch Samsung Chromebook 2. Want epic battery life? Yep, all roads lead to Samsung there, too. Well, not anymore, anyway. Acer just announced the Chromebook 13, and it matches Samsung nearly spec for spec with an optional 1080p display and NVIDIA's quad-core Tegra K1 chip, promising up to 13 hours of runtime (details on that after the break). This is interesting for two reasons. First off, although this is essentially the same class of product as what Samsung is selling, it costs $100 less: $299, versus $400 for the Chromebook 2. Sounds good, right? What's more, this is the first-ever Chrome OS device with an NVIDIA processor inside. This is potentially good news even if you're not a self-described chip geek: Tegra K1 offers long battery life, just like Samsung's own Exynos chip, but the graphics should be better for things like gaming and interactive websites -- the sorts of rich web apps frequently used in classrooms. And if you've ever used a Samsung Chromebook, you know there's room for improvement there: For all of Samsung's plus points (a crisp display, comfortable keyboard), the Chromebook 2 is relatively sluggish. But will this be more robust than those new Core i3 models we're seeing? That remains to be seen. On a superficial note, the Chromebook 13 is definitely more basic-looking than the Chromebook 2. Whereas Samsung's model comes kitted out with a fake-leather lid, the Chromebook 13 is made of plain white plastic. 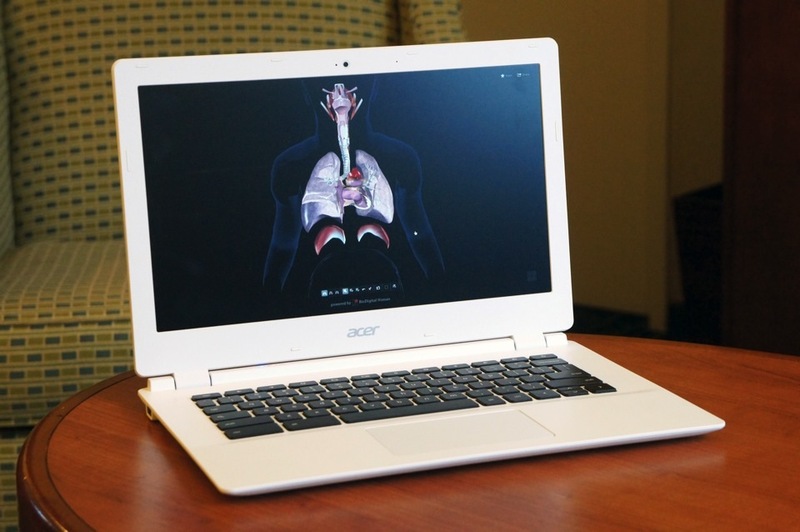 It's clear that if Acer made any sacrifices to reach that lower price point, this is it. Then again, this is a perfectly serviceable, if unexciting, design, and the full-sized keyboard is naturally more spacious than what you'll find on Acer's older 11-inch Chromebooks. The Chromebook 13 is up for pre-order today, starting at $279 with a 1,366 x 768 display, and $299 for the full HD model. Of note: The full HD machine is rated for 11 hours of battery life, compared with 13 for the 1,366 x 767 version. In addition to the US, it will be sold in various European countries, including the UK, Netherlands, Belgium, Denmark, Sweden, Finland, Norway, France, Germany, Russia, Italy, Spain, South Africa and Switzerland. As a heads-up, the Chromebook 13 doesn't have a touchscreen for now, though that could change: When we asked an NVIDIA rep if a touch edition was in the works, he winked and said "That's an interesting idea." Consider it confirmed, folks. Almost. GoPro footage is great when well-shot, but the jittery results from less-talented individuals can induce nausea or seizures. If you're interested in doing sped-up time lapse shots, however, Microsoft researchers have created an algorithm that makes them video game-smooth. Their technique is not like regular video stabilization, however. Instead, the "Hyperlapse" method first calculates a 3D camera path and rough geometry of the scene. Then it creates a smooth new optimized camera path, which is used to stitch and blend existing frames to create new output frames. The team has created several sample videos as shown below, and we've got to hand it to them -- despite some artifacts, the final results feel like nearly like flying.